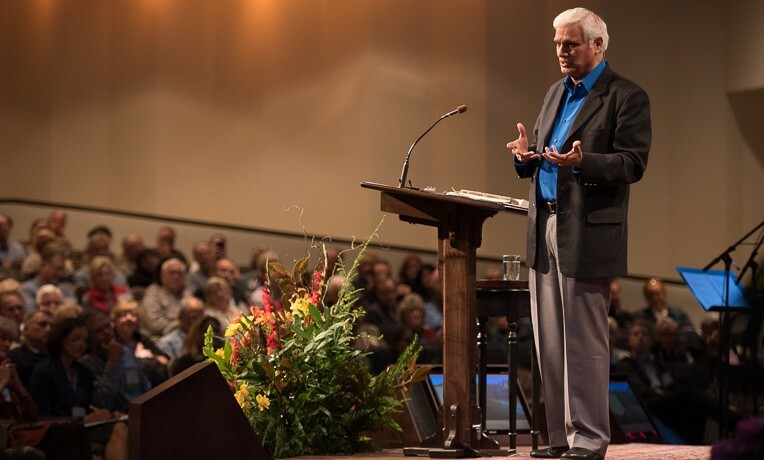 Keynote speaker Ravi Zacharias encouraged doctors to “reflect the beauty and love of Christ” as they minister to patients in overseas mission hospitals. A weekend of testimonies and inspiring messages challenge World Medical Mission doctors to use their God-given skills to make an eternal impact on sick and suffering people around the globe. The 26th annual Prescription for Renewal conference drew record attendance, as some 500 doctors, their spouses, and World Medical Mission staff gathered October 8-11 for a time of spiritual refreshment at the Billy Graham Training Center at The Cove in Asheville, North Carolina. Keynote speaker Ravi Zacharias thanked the medical professionals who serve through Samaritan’s Purse for answering God’s call to be “burden-bearers.” Zacharias is an internationally-renowned author and defender of the Christian faith whose Atlanta-based ministry celebrated its 30th anniversary this year. “I am profoundly moved by what you all are doing,” Zacharias told the capacity crowd Friday evening. “I thank God that He has trusted you with such a specific call. He not only gives you that burden, but He also gives you a close knowledge of His great love. “When you go into the world and touch the bodies of people who are sick and diseased, when you knock on someone’s door [to help them] in the middle of the night, or when you take the hand of a little child, remember they will never forget that touch or that knock,” he said. Zacharias urged his listeners to remember their highest calling is sharing the message of redemption through Jesus Christ. Although that may at times entail opposition and hardship, “we know that God is sovereign and in the end God’s truth is going to triumph,” he said. His words of encouragement were echoed in presentations by Aileen Coleman and Dr. Kent Brantly, two medical missionaries whose respective callings to the countries of Jordan and Liberia have borne much spiritual fruit in the midst of great trials. Aileen Coleman invited more medical professionals to serve in the Middle East. She has worked in medical ministry in Jordan for more than five decades. 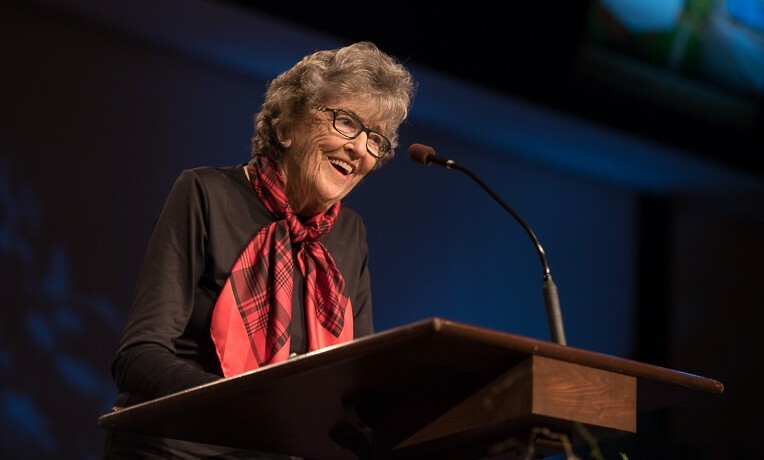 Coleman laughed as she recalled the reaction of well-meaning Christian friends who “thought I was crazy” when she and Dr. Eleanor Soltau started Annoor Sanatorium in 1965 in Mafraq, Jordan, as a medical ministry to Bedouins. Both were single women from Western cultures who had to learn Arabic, obtain the resources to provide medical care, and most importantly, win the hearts and trust of the Bedouin people. A celebration was held in Mafraq in June to mark the 50th anniversary of Annoor Sanatorium and to rejoice over the many lives that have been changed by hearing the Good News of Jesus’ love for them. 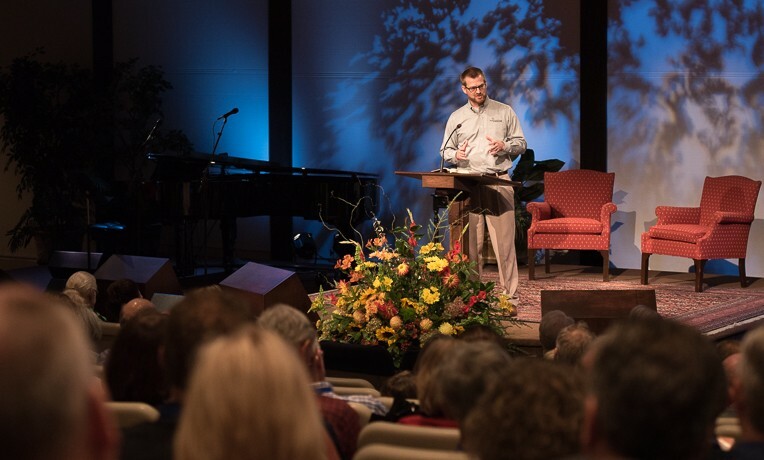 Dr. Kent Brantly and his wife Amber returned as guest speakers at Prescription for Renewal, this time sharing insights from last year’s ordeal when he contracted and nearly succumbed to Ebola while serving as a Post-Resident at ELWA Hospital in Liberia. “Ebola will forever be a pivotal part of our story. We have been amazed over and over again at how God has used our story to impact lives around the world,” he said. World Medical Mission was established in 1977 by two brothers, Drs. Richard and Lowell Furman, who wanted to help supply physicians to desperately understaffed and under-resourced mission hospitals in developing countries. Franklin Graham shared their vision, having heard many remarkable stories from Dr. Nelson Bell, his maternal grandfather who served as a medical missionary in China before the outbreak of World War II. 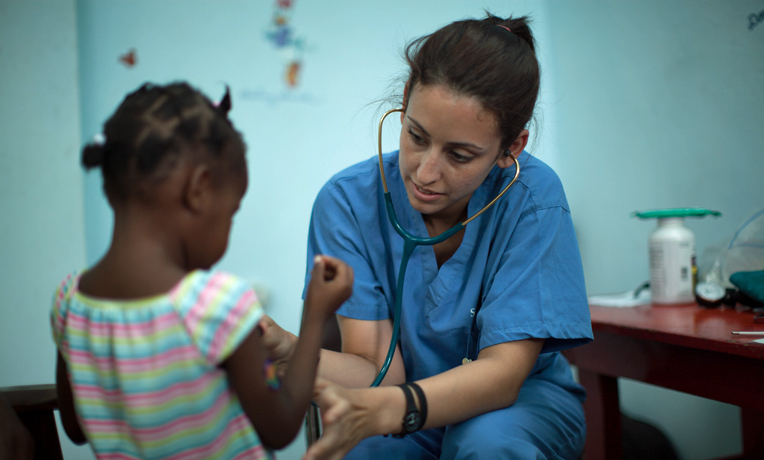 As the medical arm of Samaritan’s Purse, World Medical Mission continues to fulfill that original vision of sending healthcare professionals to the mission field for short-term stints. In 2015 alone, the ministry has sent 605 physicians, dentists, and medical residents to serve in 43 overseas hospitals, according to a report presented by Dr. Richard Furman Saturday. More than 120 young men and women have gone on two-year assignments through the Post-Residency program since 2004, including 37 who are currently serving on the field and another eight who are preparing to go. In addition, 24 more have been accepted into the 2016 program. Fifty containers filled with medical supplies were shipped to mission hospitals this year, and World Medical Mission biomedical technicians have made 16 trips overseas in 2015 repairing laboratory and operating room equipment. Among those serving this year is Dr. Sam Williams, a cardiovascular surgeon from Salem, Virginia. He and his wife, Liz, were taken by surprise Friday when they were honored as the recipients of the “In the Footsteps of the Great Physician” award. The plaque is presented annually at Prescription for Renewal in recognition of a doctor who has exhibited outstanding dedication to medical mission work. 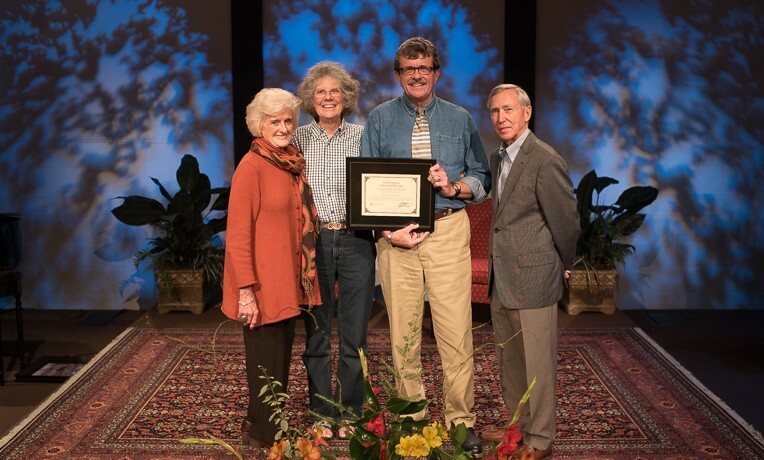 Dr. Sam Williams and his wife Liz were the recipients of the 2015 “In the Footsteps of the Great Physician” award. The couple was recognized for 25 years of service by Dr. Richard Furman and Becky Williams of World Medical Mission. Since 1990, Dr. Williams has served with World Medical Mission on 25 short-term trips. Sixteen times he has volunteered at Karolyn Kempton Memorial Hospital in Togo, and he and Liz plan to return there later this year. Liz has made herself invaluable at the Togo hospital, pitching in with gardening, cleaning, sewing, baking, and leading Bible clubs. Next year’s Prescription for Renewal conference will be held at The Cove, October 14-16. World Medical Mission World Medical Mission was established in 1977 to assist general surgeons who wanted to volunteer for short-term mission trips. Today, hundreds of volunteer Christian physicians, dentists, and other medical personnel work in mission hospitals and clinics around the world. We also staff a biomedical department and warehouse that provides critically needed equipment and supplies to these medical facilities.